Review: Speaking as someone who frequently indulges in mellow music, Round Table feat. Nino has always been a long-time favorite, but ever since I listened to “Mebae Drive” from Hidamari Sketch’s first season, Round Table and marble have dominated my relaxing songs playlist. 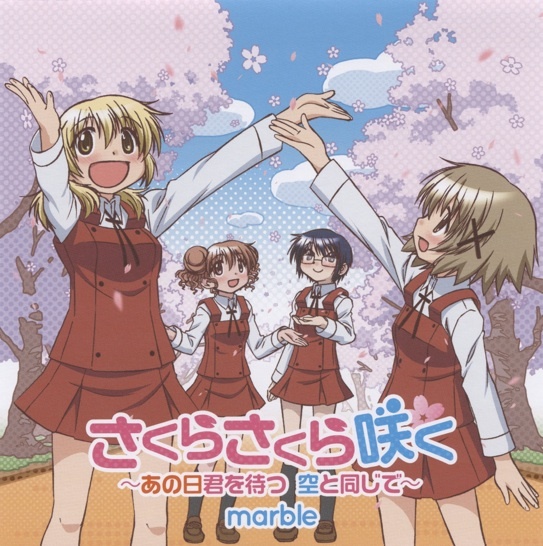 Marble has yet to disappoint in any of their anime intro/outro music. Their brand of relaxing pop music composed by Tatsuya Kikuchi coupled with the way micco’s vocals hit that sweet spot with her energy and optimism keeps me coming back for more, and Hidamari Sketch x★★★’s ED is no exception. “Sakura Sakura Saku ~Ano Hi Kimi wo Matsu Sora to Onaji de~” is wonderful. Its guitar introduction grabs your attention with its energy and micco’s entrance follows suit, carrying with it a tone that is lightly restrained, but nevertheless hints at the effusive joy just waiting to burst forth during the chorus. Sure enough, marble’s buildup fuels the happiness just a bit further until it can no longer be contained. Starting with the words “sakura saku,” our spirits are buoyed. Micco packs an energetic wallop through those words, channeling that sense of excitement that comes with the new friendships forged in this latest season as well as the assurance that this camaraderie will see them through life’s rougher patches. The outro animation adds to this feeling as the grayness dissipates in one fell swoop in favor of bright, vibrant colors that, when combined with micco’s passionate singing, brings out the exuberance that makes this song such a joy to listen to. This wonderful performance is followed by “Drury,” which opens up with the more calming side of marble. The optimism from the preceding track is still present, though with the slowness, it’s more mellow and soothing, especially during the part where the word “tonari” is repeated. Micco’s intonation here is borderline wistful, but the warmth continues to seep in and with it, the reassurance that things will turn out for the best. Marble’s strength has always been their ability to consistently deliver warm feelings coupled with energy or calmness depending on the piece and doing so in a way that resonates with me. Though I do enjoy Ryuusei Record just a bit more, “Sakura Sakura Saku” is a solid addition, and, with the additional boost from the B-side, makes it quite possibly the best Hidamari Sketch outro single to date. I really like Round Table too. Ever since NHK, I’ve loved them. Yup! I use them quite a bit whenever I happen to be in a sour mood. They’re perfect when it comes to cheering me up! As much as i love the OP. Good song, I never saw this series before though. booo/hisss But yes, it’s a solid series especially for fans of K-ON! Quite the underrated gem! Wait, Rainbow (Aria) too? I’m sold.